popular Czech newspapers Právo and it´s web version novinky.cz . You can read this article in the Articles section  now, too. „I will take my glasses off, so it will not look so intellectually,” says the former thaibox champion Jan Müller when he gets out of the martial arts gym in Brno and he sits behind the table near reception. Thaiboxer who has won many prestigious titles fits in the definition of a man as big as mountain, but he has not touched meat for twenty years, and he has not touched any animal based product for three years. And he is concerned about protection of animals and responsible consuming. You can certainly say about him that he would never hurt a fly. Only during fights in the ring in such tough sports as kickbox and thaibox he is different. “I have finished my professional career already. My left forearm holds together only thanks to titanium slat and screws. It is not good to underestimate this,” the fighter describes his last fight on top level. “I have been hit hard into my forearm and this kick has broken my arm. I have continued in this fight and have won it, which was perfect, but I have been hit during the fight repeatedly into the broken bone. When I have gone to doctor right after the fight I have had several crushed broken pieces inside,” explains former fighter and present coach who is one of the founders of the project and internet sites Vegan-fighter.com, where athletes from different sports and disciplines present as proud vegans and vegetarians. But can protection of animals and respect towards them go along with such tough sport as thaibox? “This sport is aimed aggressively, but we can say that it is aimed in the right direction, there is nothing sneaky, or villainous in it,” explains Honza and adds that fighters show their respect towards each other at the beginning in the ring, then they give everything they have within fifteen minutes and they hug at the end. “The majority of real fighters are peaceful people in civil life,” Honza persuades me. Muscles without meat? No problem! 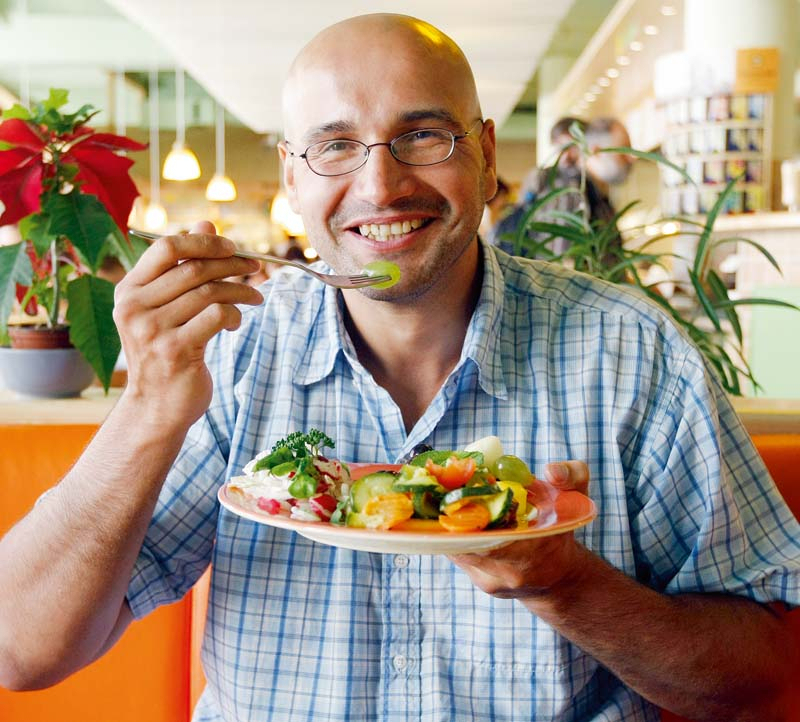 When you look at the way Jan Müller enjoys the plate full of vegetables you would not guess that you look on a super heavy weight world champion of thaiboxing. “I have often heard that I could not gain muscles if I have not eaten meat” But he quickly gained thirty kilograms of muscles. When I ask him in the gym among all noises of hits into boxing bags and screams while lifting dumbbells, how much valid is the opinion of specialists who prescribe to every athlete menu with regular income of meat, proteins that is, he answers that he has a lot of proteins from vegan food. These are mainly cereals, nuts and sunflower, pumpkin, or sesame seeds. Then, this two meters tall and hundred and eighteen kilos weighting fighter shows me that his boxing gloves are not made of leather and he assures me that people can nowadays easily buy non-leather sport accessories and clothes for daily wearing. Also cosmetic products which are not tested on animals are according to Honza easily available and consumer does not have to think too much about where to buy these products. “A lot of brands have set their marketing upon it. It is only about choosing the rack next to the one you go regularly to in your supermarket,” he explains. But what about the opinion that vegetarianism and veganism are not healthy and can cause health problems? “Vegans and vegetarians have to pay attention to their food more than people who eat meat. It can easily happen that they will miss some elements which are needed for health. For example the vitamin D. But you can supplement this vitamin by spending more time in the sun,” explains forty three years old nutritionist Eva Smutná. 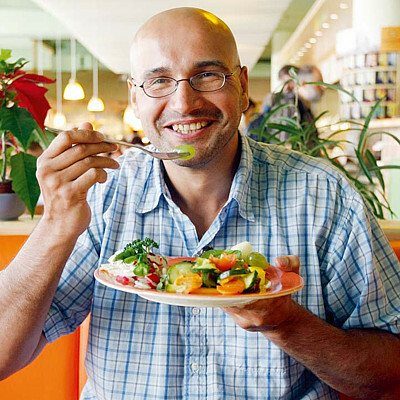 „If you do not have the right fill of fare you can lack of vitamin B12, or iron which is important for the production of red blood corpuscles” The nutritionist recommends to eat soy beans, tofu, lentils, or pumpkin seeds which contain a lot of iron and to drink coffee and tea which helps the body to absorb iron. Meat products mainly contain proteins. “If you leave them out you can have a lot of health problems. But you can replace them with plant proteins which are for example in soy,” explains the nutritionist and adds that it is important for vegans to know what important parts can be absent in their diet. This can be solved by the right food and also by supplements. Thaiboxer and vegan Iva Linda Maruščáková agrees with the need of getting information and knowledge about the right nutrition. Only so you can feel good about being respectful towards animals and nature and have more energy from purely plant diet. „It is not a cliché at all. When I turned from vegetarianism to veganism fifteen years ago I noticed that I had more energy then before,” tells Linda. Attractive, tall blonde proves this with her unbelievably busy lifestyle. Energy from vegan diet? Iva Linda who´s love is also thaibox says that she has more energy since she has started to eat vegan diet. After four years of practicing in gloves and kicking into the bag she prepares for her first fight. She quit eating meat twenty years ago, earlier before she started with boxing and concerning her vegetarianism she has never “committed a sin” within these twenty years. “When I was child it was strange to me that we eat some animals and we love some animals. That was the main reason for me to become vegetarian.” Linda even pays attention to the food she gives to her dogs. This food has to be vegan and she buys only products in which it is sure that they are made by companies that are ethical and she buys vegan cosmethics only. „Some companies do not test on animals, but they use animal material in their products,” explains Linda along with the fact that her lifestyle which is ethical towards people, animals and the environment does not have to be taken as limiting. You only have to pay attention if the brand that you buy has stamp from renowned organization. That should assure the consumer that he consumes responsively. “I have noticed increasing public interest in this problematic in the recent years. And some companies are even based on acting responsively,” explains Linda reasons why she has taken part in the start of the pages etickespotrebitelstvi.cz. The primary reason for turning into vegan, or vegetarian does not have to be animal protection. Lucie Mlejnková, who comes from Brno, has started with kickboxing and thaiboxing almost two years ago. In the present she has won twelve out of twelve fights and she has also joined the Vegan fighter project. “I did atletics, but I had to stop because of injury. When the possibility of boxing came I said that I would never fight in the ring.” But Lucie went to the gym and she liked that this tough sport is hard, demanding and she can go fully into it. “I liked that you exhaust yourself fully during the practice.” She began to practice five times a week and the results came unbelievably quickly. But even if she admits that she is successful she says that she has a lot of work to do in the technique of this tough sport. Lucie Mlejnková has started with kickboxing as an ex-athlete and after a year and a half she has begun to win one fight after another. Czech kickboxing prospect has other reasons for vegetarianism apart from animal protection. “It is a bit more complicated with me. I have eaten meat and not eaten meat. The main reason for me to be vegetarian is that meat is not good for me and my body does not take meat well,” explains Lucie along with the fact that as a former student of agricultural high school which she had attended before Faculty of sport studies on Masaryk´s university, she knows that the conditions in which animals are held are not good at all. „Animals are not treated well, they do not live in good conditions and of course that matters to me.” But on the other hand she says that if she has no other choice she eats animal products and she does not feel guilty.